THAI LION AIR has voted for ASIA'S TOP BUDGET AIRLINES from NOW TRAVEL ASIA magazine. NOW TRAVEL ASIA magazine has voted. There are tourist attractions. Tourism and airlines to encourage travel. Travel and tourism as well as tourism services in Thailand. It also supports the development of Thai tourism business. Today, the Chairman of the Board of Directors of Thai Lion Air is the representative of the prize at the NOW Travel Asia Awards Gala Ceremony in Macau. 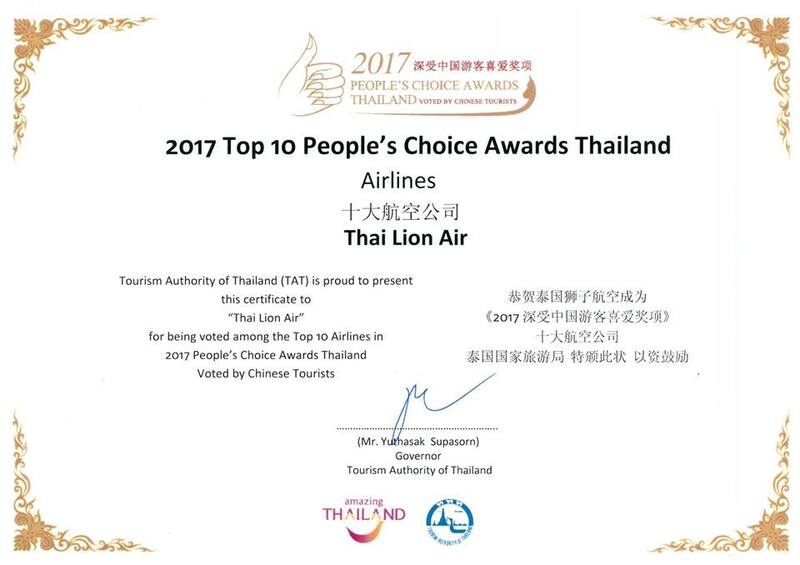 Thai Lion Air got 1in 6 Airlines popular vote from Chinese Tourists in ceremony named “2017 People’s Choice Awards Thailand Voted by Chinese Tourists”. There are 6 airlines applied for this contest 1. Thai Airways 2. Thai Lion Air 3. Thai Air Asia 4. Bangkok Airways 5. Thai Smile 6. Nok Air. This contest is to enhance Thailand’s tourism profile and brand image via social-media networks, which are frequented by millions of Chinese every day. It also helps support the many Thai tourism products, services, and airlines seeking more exposure in the Chinese market. The Tourism Authority of Thailand (TAT) organised the voting campaign in partnership with Tencent, which owns a number of Chinese online channels; such as, WeChat (570 million users per day), QZone (330 million users per day), QQMusic (70 million users per day) and Tencent News (27 million users per day). Chinese who have travelled to Thailand were invited to vote via the website www.peopleschoiceawardsthailand.com between 26 May to 8 June, 2017. Today Lion Air is very successful. Lion Air garnered the ‘Best Brand Award 2004’ from SWA, a marketing magazine published in Indonesia. The results were tabulated from Marketing Research Specialist (MARS) based on a survey of 6,000 people in five major cities of Indonesia. Lion Air gained a 33.6 percent index with the potential of a brand to increase the number of passengers in the future. Lion’s success is based on the effort to provide satisfaction to its customers. At present Lion Air is all set to go global based on an alliance with a number of international airlines.